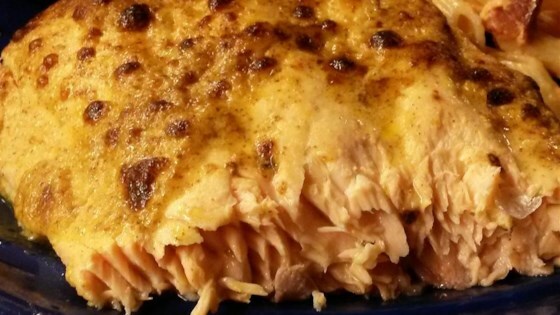 "This simple recipe makes a great salmon glaze. The sugar in the seasoned rice vinegar caramelizes under the broiler and the sweet, salty vinegar works perfectly with the tangy mustard. While my original recipe only had two ingredients, I've added Sriracha hot sauce and a pinch of salt." Set oven rack about 6 inches from the heat source and preheat the oven's broiler. Line a baking sheet with aluminum foil and rub with vegetable oil. I added more rice vinegar, honey and a little tarragon. Whole different level. I'd give it 3. 75 stars without the extras. Didn't have fresh herbs, used dried, didn't care for it. Another winner from Chef John. Easy, fast, delicious. Had no rice vinegar, so used red wine vinegar. Had no Sriracha, so used Texas Pete. Happy wife. I'm happy. Everyone's happy. Very easy and delicious. My go to recipe. I have used Durkee's Red Hot Sauce or Honey Mustard Dijon when I don't have ingredients on hand. Halved the recipe for my one piece of salmon. It was really easy and delicious! This recipe is going into my files! good, simple recipe. I added honey for a bit of sweetness and doubled the siracha - it was not too hot. Best salmon that I've ever eaten and my wife loved it. Omg. Simple, quick,just the right amount of zing. Not sweet. Who could ask for more? This was SO good and insanely easy and cheap to make! Very little prep involved and cooks in a matter of minutes! Will definitely make this again.